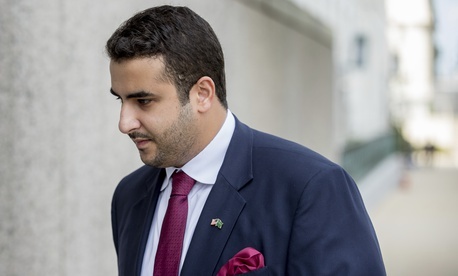 Prince Khalid bin Salman’s return Wednesday, which was confirmed by a Saudi-embassy spokesperson, came a little more than a month after he quietly left the U.S. capital in the immediate aftermath of Khashoggi’s disappearance. His return was also a day after influential senators received a classified briefing on Khashoggi’s killing from CIA Director Gina Haspel. Although they did not reveal the details of the briefing, the senators left no doubt as to who they think is responsible for the murder of The Washington Post columnist: Saudi Crown Prince Mohammed bin Salman, who is Khalid’s older brother. An ambassador’s job is to not only meet with the host country’s government, but also its legislature, and other institutions to promote his or her government’s interests. Khalid regularly posted pictures on his Twitter feed of meetings with various senators, some of which were no doubt tense given a host of problematic issues, principally the Saudi-led campaign in Yemen. But many senators’ disdain has only grown as the Saudis’ messy explanations for the killing unfolded. Though Khalid may have allies in the White House, which has made it clear it wants to move past the Khashoggi saga, it doesn’t appear he has any in the Senate. Khalid left Washington in October amid calls from U.S. officials for the kingdom to clarify its shifting explanations for Khashoggi’s death. The Saudis first said the journalist safely left the Saudi consulate in Istanbul on October 2 soon after he entered. They then said he died following a scuffle inside the consulate. Later, they acknowledged that he was killed, and subsequently charged 11 people with the death and fired two senior officials, but labeled the murder a rogue operation and absolved any top Saudi officials of culpability. Senator Lindsey Graham, an otherwise reliable ally of the White House who has emerged as perhaps the toughest critic of MbS in Congress, was asked on NBC’s Meet the Press last month whether Khalid should return as ambassador. His reply: “No.” Graham and five other senators from both parties introduced a resolution Wednesday that holds the Saudi crown prince accountable for Khashoggi’s killing. President Trump says the U.S.-Saudi relationship is far too important to damage regardless of whether MbS ordered the killing. Khalid’s return to Washington suggests the Saudi leadership thinks that either the crisis surrounding Khashoggi’s killing is over or that it has transitioned to a more manageable scale. “It would almost seem that the Saudis have taken the view that if you can deal directly with the White House, why bother with Congress?” said Simon Henderson, an expert on Saudi Arabia at the Washington Institute for Near East Policy. “And if that’s the Saudi view, I think they’re making a mistake.